Immigration’s Impact on the Midterm from TCU Student Media on Vimeo. Some Tarrant County voters were not swayed by an increased focus on immigration in the weeks leading up to the 2018 midterm election. President Donald J. Trump and other Republicans have concentrated their efforts on the Southern border, as a caravan of migrants from Central America makes their way toward the U.S. in hopes of receiving asylum. Trump has spoken repeatedly about the danger of the caravan in speeches leading up to Election Day, despite calls from some Republicans to focus on the recent success of the economy. 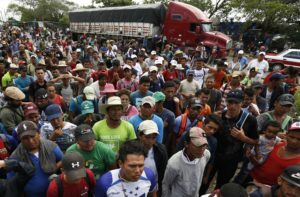 The U.S. military announced it was sending 5,200 troops to the border in anticipation of the caravan on Oct. 30. 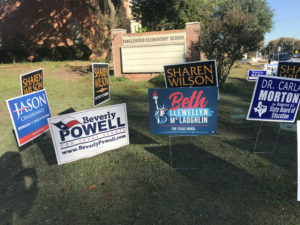 Tarrant County voters from both parties said that immigration issues didn’t influence how they voted, it only reinforced what they already believed. Republican Fred Meno said he supports the Republican platform of ensuring that everyone who enters the country enters legally. The approaching caravan only strengthened this belief. According to the American Immigration Council, those arriving at the U.S. border who are defined as refugees have the legal right to apply for asylum and live in the United States during the application process. TCU sophomore Ammei Ladeau, whose mother immigrated from China and is now a U.S. citizen, said that everyone deserves an opportunity to come to the United States. “I think that because [my mom] had the opportunity to come my life is possible here so I think it’s important that we give everyone equal opportunity to come,” she said. While they disagreed on immigration policy, Meno, Ladeau, and Democrat Jeff Johnson all agreed that the caravan was being over politicized. An ad released by the Trump campaign, featuring an illegal immigrant saying that he wants to kill police officers and that Democrats allowed him into the country, was pulled by NBC News and Fox after the networks received criticism for airing it. The ad is just one example of political campaigns on both sides using immigration to push voters in their direction. “I think it’s turned into a political issue and I think each party has galvanized their own approach to how they view the caravan and it has only reinforced their own voters and their own constituents,” Meno said. Benton McDonald is a sophomore journalism major from Austin, Texas. He hopes to continue writing about sports after graduation. He enjoys watching sports, reading and hanging out with friends. Marissa Stacy is a journalism major from Indianapolis, Indiana. Marissa enjoys traveling to new places, spending time with friends and finding great places to eat around Fort Worth.